Homecoming Week at Kokomo High School started on a bad note and ended on a horrible one. Just days after school administrators cancelled the annual powderpuff game due to property damage vandalism and for the safety of students (see editorial in the next issue of Sports Journal on Sep. 27), the varsity football game ended in a near bench clearing fight seconds before Kokomo posted a 48-27 North Central Conference victory over Richmond. With 1:41 left in the game and Kokomo leading by 21 points, Kokomo quarterback Tayler Persons took the traditional knee after the snap in an effort to run the clock out. But for reasons unknown, Richmond head coach Eric Gillespie called a timeout, forcing Kokomo to make a decision – kneel again or run a play and try for a first down. A first down would ensure Kokomo could take successive kneels and end the game even if Richmond called another timeout. Kat coach Brett Colby decided on the latter and Gordon Jenkins ran over the left tackle 12 yards before fumbling – and that is when the melee started. During the fight, which occurred in front of the Kokomo sideline at around midfield, several players threw punches, pushed and shoved each other. Persons, a sophomore who is also the Kats starting safety, appeared to throw several punches during the skirmish (it is unknown if a Richmond player instigated the situation or threw punches first). At least one Kokomo player, senior inside linebacker Isiah Young, came off the sideline to assist his teammates. Both Persons and Young were ejected, and according to IHSAA By-Laws, they are suspended from the next varsity game. Richmond junior defensive back Jimmy Bailey was also ejected. The head referee at the game said he wanted a copy of the game tapes and will submit those for the IHSAA to review. There is a chance officials will determine more players were warranted an ejection – something game officials could not see without the use of video replay. The fight overshadowed an entertaining football game. Kokomo jumped out to a 7-0 lead after a seven-yard run by Austin D’Agostino, and enjoyed a 14 point cushion after Armon Bridgeforth scored his first of four touchdowns, this one from eight-yards out. Richmond (2-4) then controlled the ball for more than five minutes, cutting the lead to 14-7 after a four-yard run from Taylor Kidd with four minutes left in the second quarter. Five plays later, Bridgeforth would send Kokomo into the locker room with a 21-7 lead after scampering 38 yards for a touchdown. Richmond, who has beaten Kokomo in 34 of the 52 meetings, owned the third quarter. After Kokomo’s first possession stalled, the Red Devils mounted a six play, 60-yard drive capped by a nine-yard Jacob Flood touchdown on a reverse. After a second Kat punt of the quarter, the Devils marched 57-yards on six plays, scoring on a Justyn Curtis to Flood 35-yard pass to tie the game at 21. Kokomo returned to form in the fourth stanza, scoring 21 points in eight minutes to put the game out of reach. The scoring started on a Will Haynes five-yard romp to cap a 47-yard drive. Kokomo’s defense forced a three-and-out, and three plays later Michael Copeland ran over the left tackle for an 11-yard score. Five plays after the score, Bridgeforth intercepted a Curtis pass and ran the pigskin back 80-yards for his third touchdown of the night. The 80-yard interception return is the fourth longest in Wildkat history (Bruce Liggin holds the record with a 99-yard return against Richmond in 1971). Bridgeforth would add a 53-yard run with three minutes left, capping his 192 yard rushing performance. 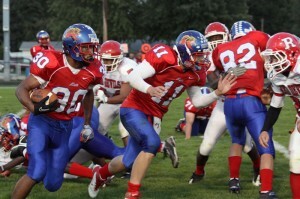 Jenkins added another 51 yards as Kokomo racked up 348 rushing yards for the night. Bridgeforth continues to climb the Kokomo all-time record board. With 2,290 rushing yards, Bridgeforth passed former Kokomo runner Darrian Story (1996-1998) for fifth on the Kats all-time rushing chart. He eclipsed the 3,000 all-purpose yard mark, passing Justin Patterson (2004-2007) for fourth all-time. He also passed Dondre Johnson (1994-1996) for third all-time in total touchdowns with 44 and he currently stands third on the career rushing touchdown list with 34. Kokomo (4-2, 4-0 in NCC play) returns to action Friday night against Logansport for Senior Night, and Coach Colby knows his team will have to make some adjustments in practice this week if it wants to run its NCC winning-streak to 34. Junior Dylan Orbaugh is listed as the Kats backup signal-caller. Coming off a tough loss to Hamilton Heights, the Eastern Comets escaped a stubborn Lewis Cass squad 21-14. Knotted at zero at the half, both teams put points on in the third stanza. But just as it looked as though this one would go to overtime tied at 14, Eastern All-State candidate Josiah Price blocked a punt, and Blake Thomas ran it back for the deciding score with 1:23 left in the game. Eastern improves to 5-1 and still has an outside shot at the Mid-Indiana Conference title. Lewis Cass falls to 1-5. There was no surprise in this contest as Western’s Quin Fields threw for three touchdowns and the Panthers ran over the winless Bengal Tigers. Western is now 5-1 and 4-0 in Mid-Indiana Conference play as they travel to Greentown Friday night for a huge contest against the soaring Comets. The Purple Tigers kept its MIC hopes alive with an easy win over the winless Braves of Maconaquah. Northwestern improves to 5-1, 3-1 in conference play, and will host undefeated Hamilton Heights Friday night. Taylor ran into a buzz saw in the form of the fourth ranked team in Class 3A, and Heights cruised to an easy shutout win. Taylor stands at 1-5 on the season, while the undefeated Huskies play Northwestern Friday night. This entry was posted in Eastern, Football, High School, Kokomo, North Central Conference, Northwestern, Red Devils, Richmond, Taylor, Western, Wildkats. Bookmark the permalink.